Beach blankets can help in just about any situation, though they are mainly made with lounging on the beach in mind. When you want to enjoy the outdoors in comfort, you should consider getting a nice, sturdy beach blanket. We’ve done all of the research to bring you the absolute best that is available right now. Before we get started, here are some things that you should know about beach blankets. Keep these in mind while shopping! Size: The size of the blanket, most commonly presented in feet, can tell you just how many people can fit on it. It can also tell you if it will make a good tarp or cover for a tent. Color: What color does the blanket come in? Most come in multiple colors, so check when you order that you’re getting the one that you prefer. We’ll let you know if there are other options available. Material: What is it made of? The most popular material for a beach blanket is nylon by far, though polyester is fairly common as well. There are even some blankets made of wool that repel water and sand. Sand Proof: Speaking of sand, we’ll tell you here if it’s sand resistant. What that means is that it doesn’t collect sand like a regular blanket would and helps keep your lounging space comfortable and free of sand. Water Resistant: It’s good to know if your blanket is going to repel water, especially when you’re using it over damp ground or near the surf. We’ll tell you if the blanket is going to resist water or not here. Carrying Bag or Handle: Most blankets on this list have a carrying bag or a handle that you can use to help make carrying them in a compact format more plausible. It can also help you carry it in your hiking bag. With all of that out of the way, we can start taking a look at some of these amazing beach blankets. We’ve done the research to bring you only the best and we’re sure that you’ll find a blanket that fits your outdoor lifestyle! Our top pick and budget pick are our favorites, so start there before checking out the rest of the beach blankets on our list. You might find your new favorite picnic companion! Kahuna makes one of the best beach blankets for sand that we could find! It’s made of parachute nylon, so it’s durable enough for all of your travels. This giant beach blanket is 8 feet by 8 feet and big enough for up to four people to recline on it. It’s lightweight and portable and packs down into a small pouch. It’s great for outdoor events and picnics, as you can use it in the grass as well. 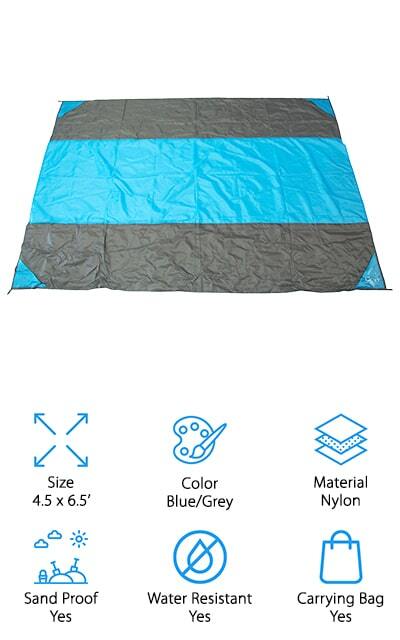 It’s great for camping or for a ground tarp to keep your items from getting dirty. It even works as a travel blanket! Going on a long hike? Take it with you! It’s lightweight enough not to burden you on your way. It includes and pockets and ground stakes to keep sand away and to keep it in place during windy days. If it gets wet, it will dry again in minutes due to the parachute material it is made of. 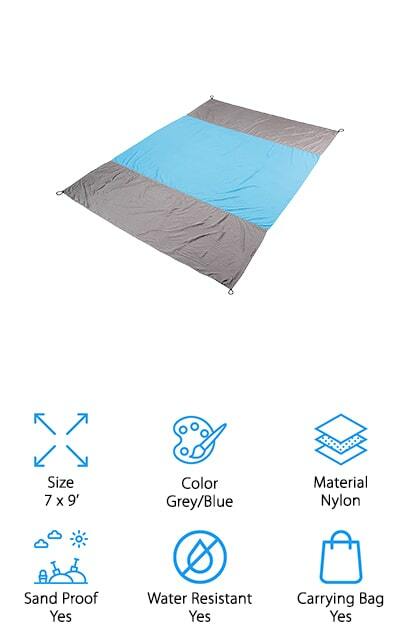 The Scuddles Outdoor Blanket is durable and backed with a waterproof PEVA lining to keep moisture from the ground or the surf out of your blanket. It’s comfortable to sit on and easily cleans and folds back up to carry. You can lounge in any setting with this beautiful mat, whether you’re camping, taking a beach day, or going to an outdoor concert! It’s got a tartan design, but there are a few other color options if this one doesn’t fit with your other gear. The handy strap keeps everything together for all of your adventures when you just might need casual seating. It’s big enough for a couple of people, and we just know that you’re going to love it! The attractive design and waterproof backing really make this blanket stand out on our list. You can use it just about anywhere, and we appreciate that as well. Make your next adventure that much more comfortable. This family-sized beach blanket by WildHorn Outfitters is big enough that your entire family will be able to sit together on the beach or your next outdoor event. This beach blanket is made from parachute nylon that dries quickly and is extremely breathable. You can use it as a throw blanket if you need it because it’s just that comfortable! It’s also sand resistant so you won’t be uncomfortable while you’re lounging. There are four sand anchor pockets that help hold the blanket down when you fill them with sand. You don’t have to carry anything extra for this to work. If you’re in a location or situation where you don’t need to fill these pockets with sand, they can double as places to store personal items so they don’t get stepped on while you and your family have fun on the beach or during a soccer game. We love all of the pockets on this blanket! 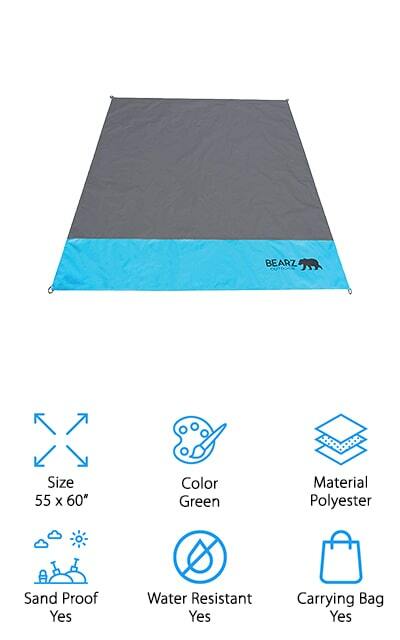 BEARZ makes this beautiful, versatile sand resistant beach blanket. It’s made of comfortable polyester that you’re going to love sitting on, but it can also be used as a tarp, a beach mat, or a rainfly or improvised shelter as well. It’s great to have it with you in case you come into a situation where you need it. It’s durable and compact, and easy to fold up into a very small package so that you can take it with you. 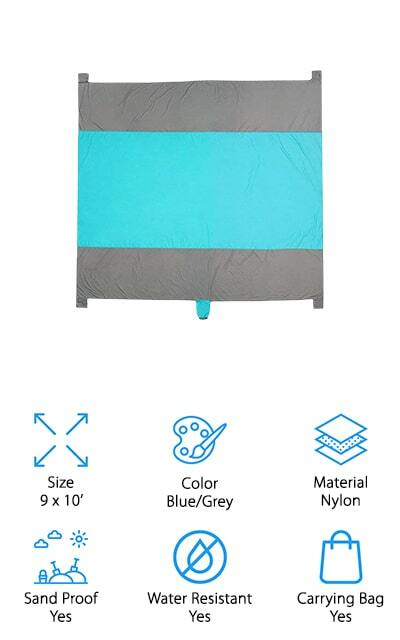 This blanket is waterproof, sandproof, and puncture resistant, so you can use it while camping in the middle of the woods too. There are pockets for rocks or sand to keep it down during windy days, or you can use the pocket loops for camping stakes. It can fit two people with room to spare! You can choose your favorite color – the green seen here, or your choice of blue, pink, yellow, red, or digital camouflage. This large beach towel blanket is perfect for whatever outdoor activity you’re planning, from the beach to camping or just hanging out at the park. It’s made of thick parachute nylon, so it’s resistant to sand, water, grass stains, and even tearing. It dries within a few moments of getting wet so you don’t have to worry about your day being ruined. There are four fillable pockets around the perimeter of the blanket, as well as space for aluminum stakes. Don’t let the wind carry your beach blanket away! 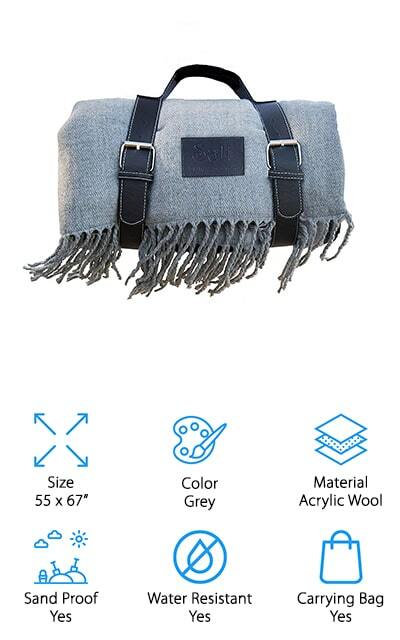 The entire blanket folds down compact for its size and can be stuffed back into a carrying sack that’s perfect with your other gear or a beach bag. Whether you’re going to a soccer game or hosting a chill backyard barbecue, you can’t go wrong with having this blanket as part of your ensemble. It’s even friendly and comfortable on your skin! You and your family will love it. Bertte makes the best sand proof beach blanket on our list so far, with a large surface area that fits the entire family. The polyester fabric top is soft and smooth to the touch, making this the perfect kids beach blanket as well. The colors options are all fun and vibrant as well! 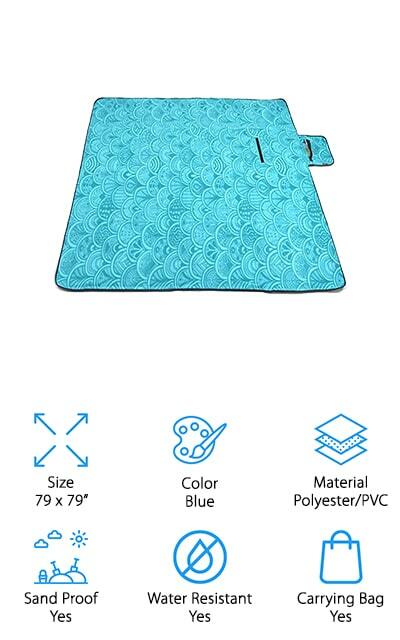 There is a cotton cushion in the middle of this blanket, making it the perfect comfortable mat for sitting with the family. 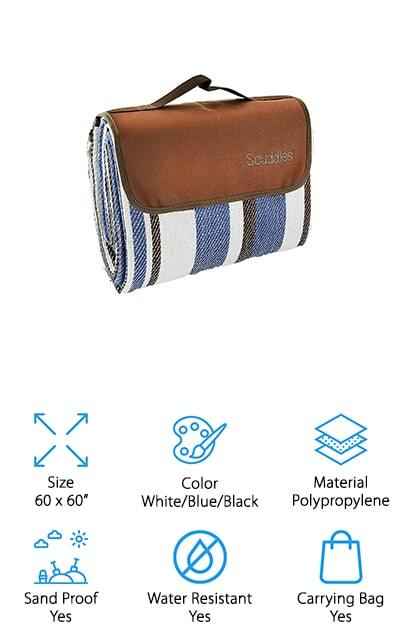 The backing is made of a durable Ripstop oxford cloth, which is water resistant and sand resistant as well. Grass won’t stain, and you can easily shake it out if anything gets onto the top. It’s great for any surface, and when you’re done with it you can fold it up into the compact carrying bag with a handle. It’s great for all of your outdoor activities, and you can even use it in your home. It’s machine washable and easy to clean! 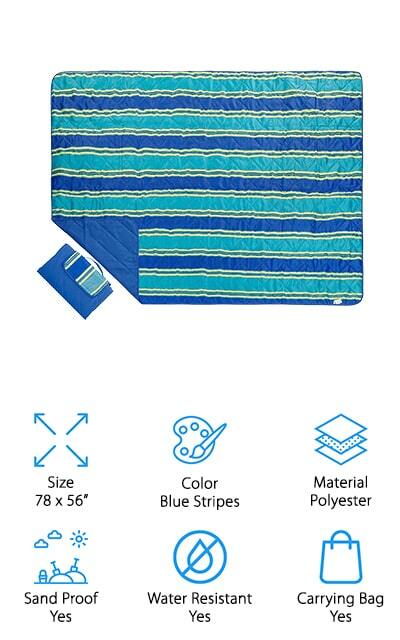 This Campanzee Beach Blanket is one of the best sand free beach blankets we found during our research. There are three beautiful and vibrant color options that you can choose from when you order. Each blanket has five different sand pockets to help weigh it down during windy outings, as well as four stakes so you can tack the corners down. It’s made of waterproof and sand-proof 210T Rip-Stop Nylon, which is the same type of material that some tents are made out of. It’s also a remarkably large blanket that will comfortably seat 7 people (or act as a footprint for a tent if you forget yours). Also, you can use it as an emergency shelter, so it’s worth having it with you. It is machine washable and dries instantly when you get it wet. We love how adaptable this blanket is and how many different uses it has. Don’t leave home without it! Topnuna is made of a top-quality material – 400T Nylon, which is waterproof and sand proof as well as being nearly impossible to rip. It’s lightweight and can compact down to a small size for storage and transport. You can take it with you in your hiking pack in case you need a shelter right away, or else need to use it as a blanket later on. It’s small enough you won’t even know it’s there! There are 5 fillable pockets you can use to hold it down, and you can put rocks, sand, or whatever’s available in there to keep it from blowing away in the wind. You can also anchor it down with the stakes that are included so that you’re sure to have a secure blanket. 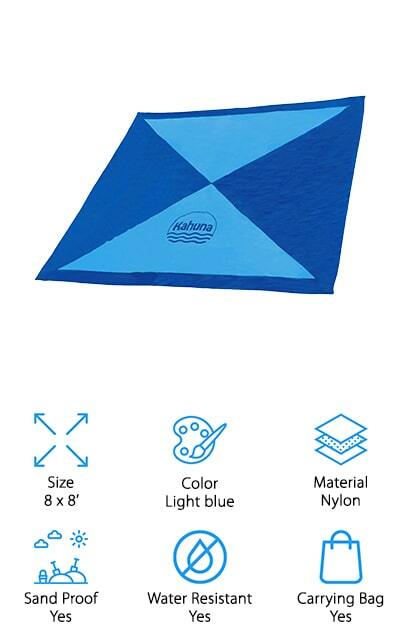 It’s a great kids beach blanket or playmat, and you can use it to keep you dry on a camping trip. This versatile blanket weighs almost nothing! This beach blanket by Wild in Bloom is unique on our list for being made of acrylic wool. It’s a luxurious beach blanket that’s stylish and soft, making it the best beach blanket for baby when you take the family outdoors. It’s got carrying straps and works for just about any activity that nylon blankets can be used for. It’s got a waterproof backing that will also protect you from grass, sand, and dirt, as well as keeping rocks from tearing the soft top. It’s durable enough for a protective barrier, but you’re going to want to get comfortable with it as well. You can use it as a throw blanket to help keep you warm and comfortable in a pinch as well. It doesn’t get much more luxurious than this, with its soft grey pattern and large surface area that your entire family is going to love. There are three layers that make this blanket great! ZOMAKE makes this waterproof beach blanket that will keep you dry even on wet ground. 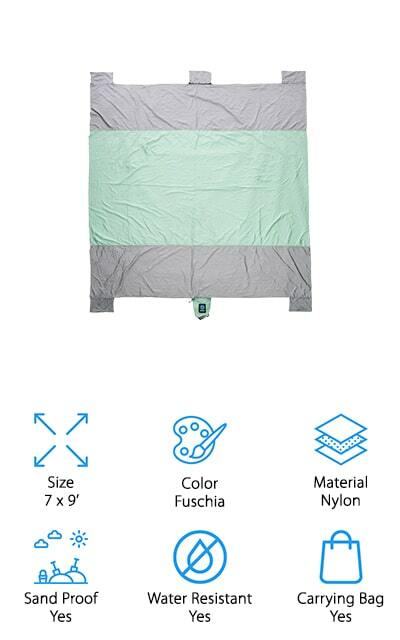 There are three layers to this blanket, including a sturdy polyester on the top, a sponge middle for comfort and warmth, and a PVC bottom to protect against water, sand, and ground cover. It’s insulated from even the most penetrating of moistures, and you can just wipe it clean when you’re finished with it. Keep it in your car or toss it into your hiking backpack to keep it in reach when you need it. You can use it in a ton of different situations and scenarios where you would definitely benefit from having it on hand. It’s compact and has a carry handle so you can easily move it from one location to another, and the top is soft and comfortable for lounging on. We love that when you’re done with this picnic blanket, you can just shake it out and fold it up!